Discover the world of marketing with our diverse range of courses. Whether you are interested in learning about marketing decision making or even event management, we have a suite of progressive courses. Gain the skills to take your career further you can study at degree or postgraduate level. 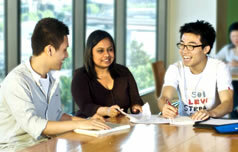 Our marketing courses are provided by our College of Business and College of Arts. Gain a broad introduction to the industry and develop a range of skills relevant to working in the business sector. The Graduate Diploma of Business (Marketing) offers graduates a critical overview of marketing theory. Broaden your career prospects to become a leader in the marketing field with a Master of Business (Marketing) at Victoria University. Study the Graduate Certificate in Marketing to develop ethical and sustainable marketing programs for a diverse set of stakeholders, in a constantly changing digital and marketing environment. Become a leader in marketing with expertise and practical skills tailored to the changing dynamic and digital marketplace, with the Master of Marketing. Learn to promote the sport you love in community or elite settings, with a Graduate Certificate in Sport Marketing from VU. The sport-marketing qualification teaches you to build the brand and customer awareness of sport organisations.